‘Tis the season for end-of-year book lists, and while there are a fair number of really awful ones doing the rounds, I have seen a few worth perusing. 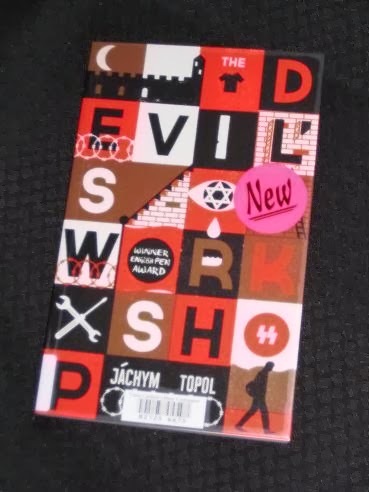 Among the books on those lists, one book which keeps cropping up is Jáchym Topol’s novel The Devil’s Workshop (released in the UK by Portobello Books), and as luck would have it, my library has just acquired a copy (I suspect I’m the first person to read it…). A book which comes highly recommended then – but does it live up to the hype? The Devil’s Workshop (translated by Alex Zucker) starts off with a man in a ditch, hiding from the police and running away from a city in flames (which is always an interesting way to start a novel). Before too long, we’re taken back a little to learn how he got there, ending up in the Czech town of Terezín, the site of a Nazi-era prison, the last stop before the concentration camps. The Devil’s Workshop is a fairly short book, but a lot happens in the space of its 160 pages. It’s a novel which draws the reader’s attention to what happened in the Second World War before moving on to later atrocities; while Terezín is fairly well known (especially to anyone who has read Sebald’s Austerlitz…), events that took place in Belarus are less understood. Topol uses the structure of his book, a story in two halves, to compare and contrast the two events, creating some very clever, effective parallels. These shattered young people are only too willing to help create a Holocaust tourist industry, one underwritten by rich sympathisers, in an attempt to come to terms with the past. Sadly though, we also get glimpses of a fascist present when the narrator witnesses the ‘Patriot Guards’ chasing ethnic kids through the streets of Prague (plus ça change…). “Museum, I say, looking around. What museum? Besides the mannequins there’s nothing but crates. Crates full of specimens. The Devil’s Workshop is a great, quick read, a novel which is very much action-driven, keeping the narrator (and the reader) constantly on the move. The book is very cleverly plotted, with two parallel halves, the second being a monstrous, deformed version of the first. The only drawback for me is that the writing is fairly simple. It’s a great story, full of thought-provoking ideas, but fairly ordinary prose. That’s a minor quibble though, and I suspect that this wouldn’t be an issue for the majority of readers. I've been eyeing this book for a while and still do, though I must say I'm a bit put off by what you say about the simple writing. Fortunately I have Trieste and Stone upon Stone on my shelves and those will have to be read before I can start considering what to do about The Devil's Workshop. Looking forward to your next posts! I know, but I've been avoiding reading your posts until I've read the books!